Beyond POC: How to foster long-term relationships between corporates and startups? Corporations and startups have a great deal to learn from one another. 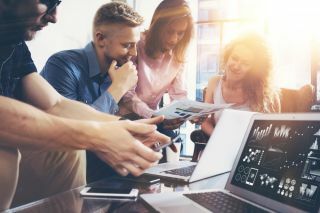 Large corporations are increasingly looking to innovate, and on the hunt to integrate new technologies into their processes to make them faster, better and more accurate. This is why more and more, they are turning to startups to achieve these goals. Corporates are usually comfortable in working with established SMEs, much less with very young innovative ventures. One of the most recent learning curves for corporations working with early stage ventures has been that starting big does not harness the speediest success. As such, the favoured method for a corporate to test an identified an innovative solution is to launch a Proof of Concept (POC). A POC allows corporates to start small and fast. There is very little commitment involved in a POC, and the collaboration gives insights into the service’s capacity in solving a corporate challenge, and how the two stakeholders can work together on a larger scale. For startups, POCs are also useful. Four in ten start-ups fail within the first five years, not merely because of their inability to attract funds but because they cannot generate revenues by acquiring clients. POCs provide an opportunity to engage fast with a corporate with technically little limitation, and prove the value of a venture’s services. An entrepreneur will likely find it easier to negotiate a £10k deal rather than a £100k one to start off. Seeing the benefits for both parties, it is no surprise then, that more start-ups and corporates than ever are igniting their collaborations with POCs across many sectors. But the multiplication of POCs hides an essential challenge: many start-ups and large corporations fail to pin down a long-term relationship beyond the proof of concept. Yet, success can only be found for both actors by moving from trialling a POC to an actual deployment. So how can startups and corporates work beyond a POC and foster a long-term relationship? Let’s examine various challenges they face, and look into a change in methodology that will support long-term relationships. Many blue-chip organisations are stuck in historical processes that are very hard to change. While being powerhouses within their industry, their legacy (product, management, legal, IT) also prevents them from adapting and thinking beyond “business as usual”. To jump on the innovation bangwagon, some corporates do startup-washing – using POCs to showcase their work with startups. This is detrimental to the startups, who cannot survive on the sole launch of POCs. But this is also detrimental to the corporates. They adhere to the illusion that they are innovating - while in fact they are not. If the corporate leadership does not have the right long term vision and foresight, it faces the fate of Kodak, a once innovative an beloved multinational that went bankrupt in 2012. Changing culture and a traditional business approach may be the hardest challenge to tackle. Any corporate management must be willing to accept that for things to move forward, it will require strong leadership ambition, a genuine commitment to deploy innovation, accepting technical and human challenges, considerable investment, and a overhaul of IT at the least. Testing a startup service on a small segment size is a fairly simple process. Most POCs can run “straight out of the box” with minimal programming involved. However, it’s a different ball-game when attempting to deploy and integrate this service to a large, old and mineful infrastructure. Corporates, but also at times startups, can find the IT deployment process daunting, and back down when facing the magnitude of the task. There is no one solution, as the architecture legacy differs from one corporate to another, as well as the startup solution that could be deployed – but corporates, startups and third parties should work towards defining a framework - a protocol of integration - that would first prepare the corporate for the IT changes coming ahead, and second educate the startups in how to handle the integration with limited resources. Criteria of success should be set from the very beginning when launching POCs. On the corporate side, innovation directors should clearly define the goals targeted: improve efficiency, cut costs increase leads or develop new products for instance, then see the POC’s proofs of achievement. On the startup side, entrepreneurs should be comfortable discussing these KPIs, and openly say if they are the right ones, and if they can be trackable efficiently. Once the POC is finalised, both parties should sit together to assess the outcome and key learnings. If fundamental KPIs have been successfully achieved, a conversation should be engaged around next steps for deployment to a larger pool of users, and the feasibility. Deployment is always a tricky phase when one looks at pure financials: integrating a piece of software for instance, may incur heavy investments for a corporate – change in IT systems, training of staff may all seem like a burden in the short term. Yet, inaction may be even more costly. In long-term, such technology may improve processes and efficiency that will save costs multiple-fold. Essentially, POCs are easy to deploy, taking little costs and fine-tuning. However, this approach has led to some corporates expecting very little at the end. There should of course be “no hard feelings” if a POC does not result in deployment, but not taking a POC seriously can be damageable. For corporates, it may mean they are using a budget that could otherwise have been used for other means, but are also building a reputation amongst the entrepreneurial community, as sole PoCers rather than serious clients. For startups, the risks are even higher: many start-ups project their growth based on the amount and value of the number of POCs that develop into long-term partnerships. As such, some startups will deploy extra limited resources and time to show value to their customers, sometimes even deriving from their core product to adapt it to a client’s specifics. If a startup is about to launch a POC but there is with certaintly no intention of deployment, then it may sometimes be better to walk away for the startup’s survival. This is why it is important that a POC be deployed to achieve a short-term target (PoA), which if it does, should unlock the conversation for a long-term partnership. When speaking about corporate startup relationships, there is a general understanding that corporates need to understand the entrepreneurial approach and adapt to it much more. But less is said about startups’ need to have a better comprehension of how corporates work. Corporates are unlikely change their processes anytime soon. Therefore, it falls upon entrepreneurs to accept they will not receive ROI overnight, and that it takes weeks for an idea to be considered, approved by the board, tested and then deployed. For entrepreneurs with prior experience in the private sector, this should not be an issue, but young entrepreneurs need boost their knowledge of the corporate world if they wish to sell well. Both start-ups and corporates must better appreciate the models of each other’s businesses in order to foster long-term relationships. If the goal of a start-up is to scale and the goal of a corporate to innovate efficiently, then moving beyond the POC phase and fostering long-term relationships will ultimately help realise their respective objectives.